Corel is giving TechRadar readers 10% discount on PaintShop Pro 2018 Ultimate using the voucher code TECHRADAR10. That's on top of an existing discount, slashing the price from US$99.99/£89.99/AU$129 to US$71.99/£71.99/AU$104.40. 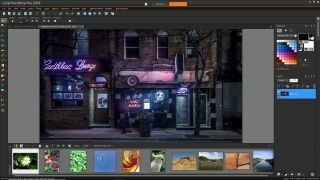 PaintShop Pro is a powerful photo editor that's a great alternative for hobbyist photographers who don't need the power (or expense) of PhotoShop, but it's also a complete digital painting suite with realistic brushes. PaintShop Pro 2018 Ultimate is easy to pick up, with a choice of interfaces (a simplified version for beginners and a more detailed layout for more confident users) and comprehensive guides presented in a clear Learning Guide. PhotoShop takes months to master, but you can get started with PaintShop Pro in a single day. All the usual photo editing tools are easily accessible, with clear explanations. You'll find one-click enhancements to give your pictures an instant boost, but there are also fully customizable tools that will help you improve your pictures while explaining the fundamentals of color and composition. PaintShop Pro 2018 Ultimate also includes realistic simulations of artistic media – both wet (paint) and dry (pastels and pencils). You can use these on a textured canvas, or on top of a photo for fascinating creative effects. PaintShop Pro 2018 Ultimate also includes the ParticleShop plugin, giving you a selection of dynamic speckle brushes powered by technology taken straight from premium art software Corel Painter. To claim your discount, add PaintShop Pro 2018 Ultimate to your basket, then tick the box marked 'Check to enter coupon code' at the checkout and enter the code TECHRADAR10.